"The city life smells great." The sight of a canine sticking his head out of a car window is a familiar one. Most dogs love doing it, whether they're Great Danes or Yorkshire terriers. Although it may seem like dogs do this just to revel in the scenery, they also like taking in the various outdoor smells. Cats aren't the only curious pets around. Dogs can be just as inquisitive as felines. After all, they spend a lot of time in the same environments every day, whether inside of your home, in your backyard or walking around your neighborhood. By sticking their heads out of car windows, dogs get the rare opportunity to soak up the brand new and unfamiliar sights, whether the laughing members of the family in the next car or the cows grazing in the rural fields. Stagnant car air is no party for humans or dogs. By poking their heads out of car windows, canines receive the chance to experience the coolness of the moving wind against their furry bodies -- a fun bonus especially on warmer days. Dogs extract a lot about the planet around them through their sense of smell, which is incomparably more potent than your olfactory sense. 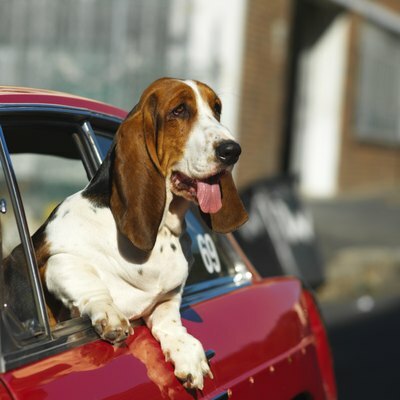 If a dog sticks his head out of the car window, then he can experience a multitude of different -- and exciting -- smells practically all at once. Whether you drive by the ocean or a bakery full of fresh and yummy bread, your dog can encounter thrilling scents that he wouldn't normally whiff. It is undeniable that many dogs find sticking their heads out of car windows to be exciting, refreshing and relaxing experiences. Despite that, it is crucial to never allow your precious dog to engage in this behavior. It simply is too dangerous for a couple of reasons. Not only can overstimulated dogs accidentally fall or leap out from rapidly moving vehicles, they risk the chance of passing matter getting into their eyes, ears or mouths. Whether a tiny rock, dust or insect, you want to make sure that foreign items never get inside of your pooch's body. If your dog's ears flutter around wildly in the wind, it also can trigger detrimental consequences. Rushing cold winds traveling aggressively into your dog's lungs can be a tremendous hazard as well. Reader's Digest Canada: Why Do Dogs Put Their Head Out the Window? Why Do Dogs Urinate on their Owner's Clothing? Do Dogs Like a Skunk's Scent? Why Do Dogs Roll in Dead Things That Smell Bad?